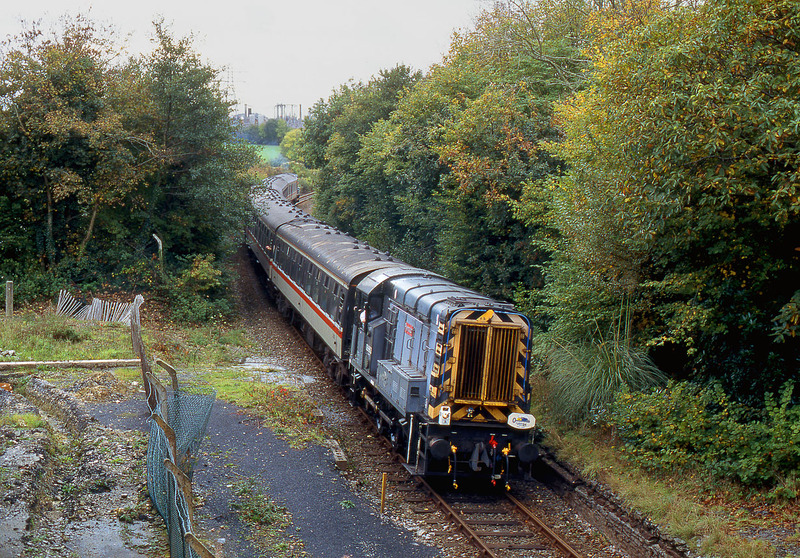 Occasionally Class 08s are used for short stretches on railtours, usually through freight yards, or for short distances near stations. However, on 23 October 1994, a pair of 08s were used for some serious railtour mileage, traversing the seven mile long Bere Alston branch. 08663 Plymouth passes the site of Tamerton Foliot station (closed in 1962) with the 1Z27 07:50 Bristol Temple Meads to Sandplace 'Pixie Returns' railtour. 08645 can just be seen on the rear of the train. The train had been worked down from Bristol by 37412 Driver John Elliott. Tamerton Foliot station was not ideally situated, being down a long no through road, well over a mile from the village, and not far from the estuary of the River Tamar.